The glaciations which are a hallmark of the Pleistocene, actual began sometime in the late Pliocene. The extent varied but each of the three largest Ice Age glacial events produced noticeable marine fauna changes along the Western Atlantic coast. As temperatures warmed during the first major interglacial of the earliest Pleistocene, rising sea levels formed the rich shell beds of the Caloosahatchee, Waccamaw and James City Formations that we see today in the quarries and river bluffs in the Eastern United States. This transgression which flooded the older Piacenzian basins, introduced molluscan species which included Pliocene survivors and new species which evolved in an interval of less than hundred thousand years from the end of the Pliocene. In much of the same manner that I compiled a fauna list of the Upper Pliocene species in my collection, I wanted to do the same for the Lower Pleistocene. However, as I began writing this installment, the Florida Museum of Natural History came out with the latest of their Florida Paleontological Society series on the invertebrate fauna of Florida; that of the marine mollusks of the Nashua Formation. The Lower Pleistocene Nashua was deposited along the Northern Florida Atlantic coast and found mostly in quarries and a few natural deposits along the St. Johns River. The most famous of the Nashua quarries was the Fort Drum Mine, known to fossil and mineral collectors alike for a bed of the clam Mercenaria permagna whose interiors were lined with calcite crystals. Although I never had the opportunity to collect in these quarries, I did acquire a few in trades to add to my fauna list (fig. 1). 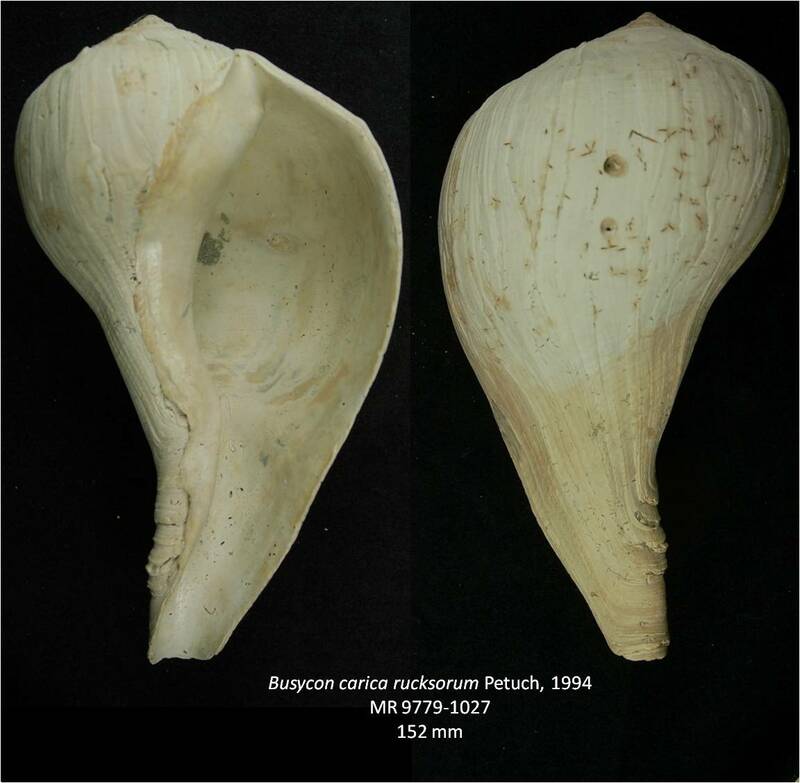 The Nashua’s molluscan fauna included an interesting mix of species from the northern Waccamaw and James City Formations, the southern Caloosahatchee Marl, as well as endemic species and forms. The six month delay between this and my last post was in part due to Nashua species shared between the different Lower Pleistocene formations described by Ed Petuch which I had considered synonyms to other species but are considered valid by FMNH in this latest publication. I still think that some of these are synonyms of previously described species but I do not have the large comparative collection to support my assumption so in most cases, although not all, I have accepted Petuch species which have been vetted by the Florida Museum of Natural History. As a result when comparing this comprehensive list of the Lower Pleistocene with species lists of the individual formations from my earlier posts, one will see some differences. My new list also includes updated generic names gleaned from the FMNH Nashua fauna list. Figure 1. Gastropods from the Nashua Formation. Also included within the list are James City Formation fossils found in exposures along the Neuse River in North Carolina that I did not include in my earlier post on the James City. Among the new additions are shark teeth and other vertebrates found from washed James City sediments that were thrown up by tides upon an Upper Pleistocene/Holocene bog exposure (fig. 2). Figure 2. Locality 1035, Neuse River, Craven County, North Carolina. The reasoning that I used for the systematic structure in my Early Pleistocene list is the same as in my Upper Pliocene list (http://www.thefossilforum.com/index.php?/blog/101/entry-233-the-end-of-my-pliocene-project/) and taxonomic classification is addressed in the notes section below. Abbreviations used in the list are James City (J), Waccamaw (W), Nashua (N), and Caloosahatchee (C ). Bryozoa. With the exception of Hippoporidra edax with its diagnostic monitcules, most bryozoa in my collection are not listed to genus or species for the lack of adequate references. Anthozoa. The Caloosahatchee Marl was deposited in a protected lagoon/marine environment in what was then the flooded everglades basin. Because of the shallowness of what Ed Petuch calls the Caloosahatchee Subsea, the super-heated water temperatures produced tropical conditions supportive of a diverse coral fauna. In contrast, the subtropical Waccamaw and warm temperate James City Formation contained only a few species which could tolerate cooler waters. Mollusca. My latest list contains 139 species and subspecies of bivalves, 220 of gastropods and 4 scaphopods. These totals are lower than what I reported in my collection from the Upper Pliocene but part of the reason lies in the fact that I have collected from more Piacenzian than Gelasian localities. Studies led mostly by Warren Allmon now director at the Paleontological Research Institute reported that although extinction rates were high for Pliocene mollusks, origination rates for new molluscan species were also high. 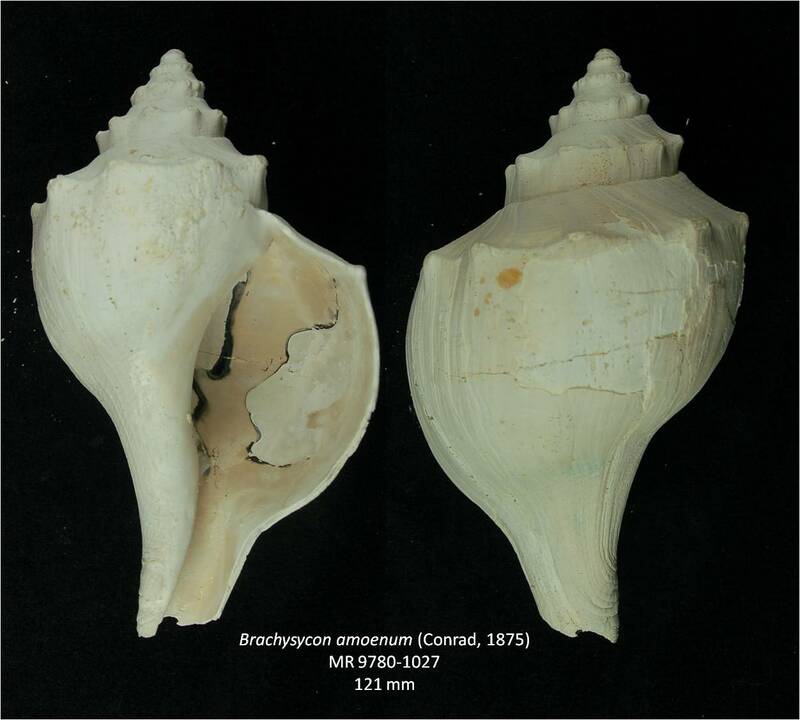 The number of mollusk species was very similar between the Caloosahatchee Marl and the older Tamiami Formation and for that of the Waccamaw compared to its older contemporary, the Duplin Formation. The exception was the James City Formation with its lower diversity compared to the earlier Zone 2 Yorktown. Anyone who had collected from the very shelly James City beds at the Lee Creek Mine might take exception with that fact however although the number of individuals was incredibly high, the diversity was much lower as the Upper Yorktown experienced periods of warm water molluscan invasions due to changes that were occurring in ocean currents from the final closure of the Isthmus of Panama during the Late Pliocene. For molluscan systematics, I continued to follow Turgeon et. al. with one exception. As I mentioned in my post about my Piacenzian collection, I was troubled about the listed classification of the subfamily/genera Glyphostoma and Cythara into the family Conidae. However in the one and half years since that post I discovered the work of Bouchet, et. al. with the superfamily Conoidea (drills, turrids, augers, cones) which based partially on DNA studies split Turridae into several families with Glyphostoma and Cythara into their own separate families. Cirripedia. Balanid barnacles were very diverse in the Eastern US Upper Pliocene with no fewer than two different mostly endemic species each in the Tamiami/Duplin/Yorktown Formations. In comparison, I have collected only three barnacles, one species each from the Caloosahatchee/Waccamaw/James City formations. Identification was made by using the dominant species found within each of those formations within published literature. Decapoda. Crabs remains are not uncommon in the Caloosahatchee and James City Formations but absent in my collection from the Waccamaw. Echinoids. Unlike crabs, echinoids are common in the Waccamaw and I have collected their remains in the majority of Waccamaw localities that I have visited. Echinoids can be relatively common in the Caloosahatchee but are restricted to specific facies. The only echinoid that I have found in the James City Formation is Mellita aclinensis, a sand dollar that survived the Pliocene extinction. Vertebrates. Upwelling of cold nutrient rich water is conducive for schooling fish and their predators and prior to the Upper Pliocene, water temperatures along the Western Atlantic were more similar to that now found along the Eastern Pacific. With the Closure of the Isthmus of Panama during the Upper Pliocene, the Western Atlantic was isolated from the cool Eastern Pacific and under the influence of the warm Caribbean. The result was lower productivity which could not support the diverse vertebrate faunas typified in earlier shell beds such as Bed 10 Calvert Formation, the Eastover Formation and Zone 1 Yorktown. Like the Upper Pliocene beds, vertebrates are not a large component in the Gelasian deposits of the Eastern United States. Of the Lower Pleistocene beds, the Caloosahatchee Marl contains the richest vertebrate fauna consisting of a mix of land and marine species which in my collection include fish, fresh/brackish reptile, cetacean, deer and the only reported instance of seal in the Caloosahatchee. During the dredging of the Intercoastal Waterway in Myrtle Beach, South Carolina during the late 70s/early 80s, a mix of Upper Cretaceous PeeDee and Lower Pleistocene Waccamaw were brought up in the spoil. Among the fossils were a land vertebrate fauna attributed to the Upper Pleistocene but could be Waccamaw. In the late 90s when I visited, some of the weathered spoil was still accessible where I found a horse tooth which I have tentatively listed as Waccamaw (W?) as well as a Hemipristis tooth which is not reported much past the Pliocene and also listed as tentative Waccamaw in my database. Many of the references that I used for my posts and identification of species in the Lower Pleistocene are the same as for the Upper Pliocene but smaller in number. This is because the Lower Pleistocene is much better characterized by monographs notably Olsson and Harbinson (Caloosahatchee), Gardner and Mansfield (Waccamaw) and Ward and Blackwelder (James City) than the Upper Pliocene particularly the Tamiami/Pinecrest. In addition to printed references, I have included websites typically affiliated with universities or museums that I have found useful in identification of species from this time period. Campbell, Lyle. 1975. Check List of Marine Pliocene Mollusks of Eastern North America in Plio-Pleistocene Faunas of the Central Carolina Coastal Plain. Geologic Notes (South Carolina Division of Geology) Vol. 19, No. 3. Campbell, Lyle. 1993. Pliocene Molluscs from the Yorktown and Chowan River Formations in Virginia. Virginia Division of Mineral Resources Publication 127. Dall W.H. 1890-1903. Contributions to the Tertiary Fauna of Florida, with Especial Reference to the Miocene Silex-Beds of Tampa and the Pliocene Beds of the Caloosahatchee River, Transactions of the Wagner Free Institute of Science of Philadelphia 3(1-VI). Gibson, Thomas G. 1987. Miocene and Pliocene Pectinidae (Bivalvia) from the Lee Creek Mine and Adjacent Areas in Geology and Paleontology of the Lee Creek Mine, North Carolina, II. Smithsonian Contributions to Paleobiology No. 61. Hendricks, Jonathan. 2008. The genus Conus (Mollusca: Neogastropoda) in the Plio-Pleistocene of the southeastern United States, Bulletins of American Paleontology 375. Kittle, B. Alex, Roger W. Portell, Harry G. Lee and Sean W. Roberts. December 2013. Mollusca, Nashua Formation (Late Pliocene to Early Pleistocene). Florida Fossil Invertebrates Part 15, 40 pp. Mansfield, W.C. 1932. Miocene Pelecypods of the Choctawhatchee Formation of Florida, Florida Geological Survey Bulletin 8, 233 pages. Mansfield, W.C. 1936. Stratigraphic Significance of Miocene, Pliocene, and Pleistocene Pectinidae in the Southeastern United States, Journal of Paleontology, Vol 10, No. 3, 24 pages. Mansfield, W.C. 1939. Notes on the Upper Tertiary and Pleistocene Mollusks of Peninsular Florida, Florida Geological Survey Bulletin 18, 128 pages. Hollister, S.C. 1971. New Vasum Species of the Subgenus Hystrivasum. Bulletins of American Paleontology 262. Olsson, A.A., and R.E. Petit. 1968 (1993 Reprint). Notes on Siphocypraea, Originally - Special Publication 9, The Paleontological Research Institute Special Publication 19: pages 77-88. Petuch, Edward J. 1994. Atlas of Florida Fossil Shells (Pliocene and Pleistocene Marine Gastropods). Chicago Spectrum Press. Portell, Roger W. and Craig W. Oyen. June 2002. Pliocene and Pleistocene Echinoids. Florida Fossil Invertebrates Part 3, 30pp. Portell, Roger W. and Jeffery G. Agnew. February 2004. Pliocene and Pleistocene Decapod Crustaceans. Florida Fossil Invertebrates Part 4, 29 pp. Portell, Roger W. and B. Alex Kittle. December 2010. Mollusca, Bermont Formation (Middle Pleistocene). Florida Fossil Invertebrates Part 13, 40 pp. Rathbun, Mary J. 1935. Fossil Crustacea of the Atlantic and Gulf coastal plain. Geological Society of America. Special papers; no. 2. Tucker, H.I. and Druid Wilson. 1932. Some new or otherwise interesting fossils from the Florida Tertiary. Bulletins of American paleontology; v. 18: no. 65. Tucker, H.I. and Druid Wilson. 1933. A second contribution to the Neogene paleontology of South Florida. Bulletins of American paleontology; v. 18: no. 66. Ward L.W. and Blackwelder, B.W. 1987. Late Pliocene and Early Pleistocene Mollusca from the James City and Chowan River Formations at the Lee Creek Mine in Geology and Paleontology of the Lee Creek Mine, North Carolina II:113-282. Weisbord, Norman E. 1966. Some late Cenozoic cirripeds from Venezuela and Florida. Bull. Amer. Paleont., vol. 50, no. 225, pp. 1-145, pls. 1-12. Weisbord, Norman E. 1974. Late Cenozoic Corals of South Florida. Bulletins of American Paleontology vol. 66, no. 285. 544 pp. Zullo, Victor A., 1992. Revision of the balanid barnacle genus Concavus Newman. Supplement to Journal of Paleontology, v. 66, no. 6, pt. II. Zullo, Victor A. and Portell, Roger W. 1993. Paleobiogeography of the Late Cenozoic Barnacle Fauna of Florida in The Neogene of Florida and Adjacent Regions, Florida Geological Survey Special Publication No. 37. Allmon, Warren D. 1992. 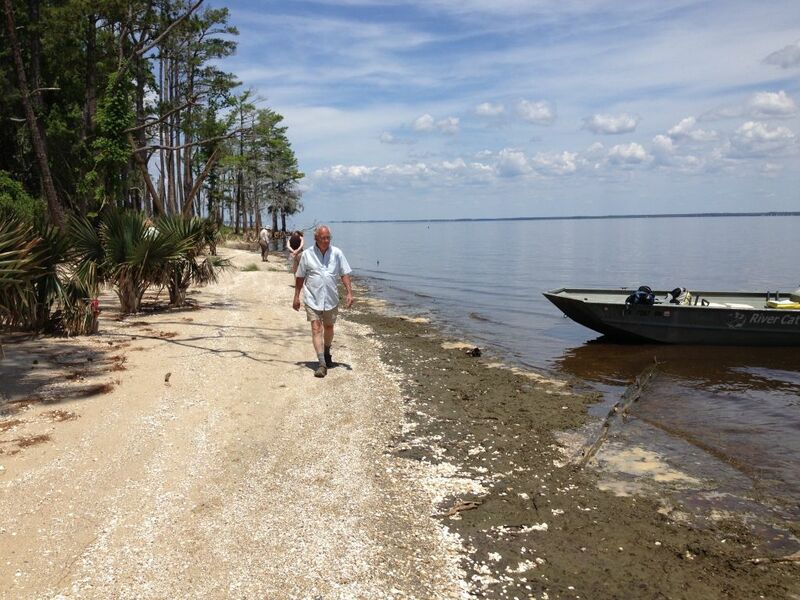 Whence Southern Florida’s Plio-Pleistocene shell beds? Plio-Pleistocene Stratigraphy and Paleontology of Southern Florida, Florida Geological Survey Special Publication No. 36. Allmon, Warren D; Rosenberg, Gary; Portell, Roger W.; and Schindler, Kevin S. 1993. Diversity of Atlantic Coastal Plain Mollusks since the Pliocene. Science, vol. 260:1626-1629. Petuch, Edward J. 2004. Cenozoic Seas. CRC Press. Petuch, Edward J. 2007. The Geology of the Everglades and Adjacent Areas. CRC Press. Dubar, J.R. and J.R. Soliday. 1963. Stratigraphy of the Neogene Deposits of the Lower Neuse Estuary, North Carolina. Southeastern Geology 4(4):213-233. Ward, Lauck W. 1992. Tertiary Molluscan Assemblages from the Salisbury Embayment of Virginia. Virginia Journal of Science, Volume 43, no. 1B. Ward, Lauck W. 2008. Synthesis of Paleontological and Stratigraphic Investigations at the Lee Creek Mine, Aurora, NC (1958-2007) in The Geology and Paleontology of the Lee Creek Mine, North Carolina, IV. Virginia Museum of Natural History Special Publication No. 14. Bouchet, P., Yu. I. Kantor, A.Sysoev and N. Puillandre. 2011. New Operational Classification of the Conoidea (Gastropoda). Journal of Molluscan Studies (2011) 77: 273–308. Hulbert, Richard C. (ed.). 2001. The Fossils Vertebrates of Florida. University Press of Florida. Turgeon, D.D. et al. 1998. Common and scientific names of aquatic invertebrates from the United States and Canada: mollusks. Second edition. American Fisheries Society Special Publication. No. 26. 526 pp. Mike, the beginning of the Pleistocene was recently "reset" to the onset of colder conditions, which used to be in the Pliocene. Now the late Blancan is Pleistocene. Thanks Rich for the clarification. My opening statement was misleading as I probably should have stated that glaciation also occurred in the Pliocene just not to the frequency as the Pleistocene. In my Pleistocene posts I have been using 2.5 mya as the Plio-Pleistocene boundry as accepted by ICS. This is based on a paper by Rio et. al. in 1998 to describe the Gelasian Stage. As I am biologist and not a geologist, I am not always up to the latest developments on global chonostratigraphy. I plan to discuss in my next post how NAMLA corresponds to transgressive/regressive phases in the Pinecrest which suggest that some of the Sarasota Pliocene shell beds were deposited in the Pleistocene.